Smoke from burning leaves engulfing a residential block in Lodhi Colony. The air pollution levels in the National Capital area are among the highest in the country. The addition of an ever increasing number of cars and other automobiles in Delhi only make the situation worse. However, and as if that wasn’t enough, the Spring season in Delhi witnesses large scale burning of fallen leaves by citizens and institutions alike. The Spring season in Delhi is otherwise beautiful with flowers of every colour dotting the city’s landscape. It is also the time when trees shed their old leaves either to grow new ones or as an adaptation to beat the heat of the approaching summer months. The fallen leaves of the Spring season collect in large numbers and are unfortunately treated as litter. They are raked aside in large heaps and these heaps of fallen organic matter can be seen burning in several parts of the Delhi. The ecological application of the leaf shedding mechanism by trees (in addition to adapting to the approaching summer months) is to return nutrients to the soil. However, the burning of leaves not only prevents the retuning of precious nutrients to the soil, it also leads to a sudden peak in air pollution in the city. It is due to this reason that the burning of leaves has been banned by the Delhi Government. However, in every Spring, the leaf litter continues to be burnt despite the ban. The simultaneous burning of small heaps of leaves in different parts of Delhi leads to air pollution, health problems, and even fire hazards. The open burning of leaves produces particulate matter and hydrocarbons, which contain a number of toxic, irritant, and carcinogenic (cancer-causing) compounds. Leaf smoke also contains carbon monoxide. The visible smoke from leaf burning is composed of tiny particles that contain a number of pollutants. If inhaled, these microscopic particles can reach the deepest regions of the lung and remain there for months or even years. Breathing particulate matter can increase the chances of respiratory infection, reduce the volume of air inhaled and impair the lungs’ ability to use that air. Particulate matter can also trigger asthma attacks in some people. It is for this reason that the burning of leaves should be completely stopped and solutions like COMPOSING need to be adopted. Composting is a simple process that involves placing the fallen leaves in a pile or bin, maintaining adequate moisture, and turning the pile periodically to mix in air. Microorganisms gradually break down the leaves into a humus-like product called compost. Composting can be practical at home or at community operated compost sites and needs to be encouraged across the city. Composting is a healthy method and does not lead to any health consequences as well. 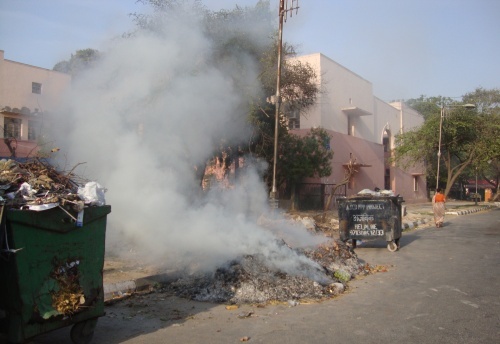 Composting needs to be encouraged by the Government agencies as well and individual Residential Welfare Associations (RWAs) can be involved to ensure the stopping of the indiscriminate burning of leaves in the city. An urgent helpline to that effect is also something that needs to be setup, in order to ensure the implementation of the ban and imposing of penalty to those individuals and institutions who continue to burn leaves unabated. 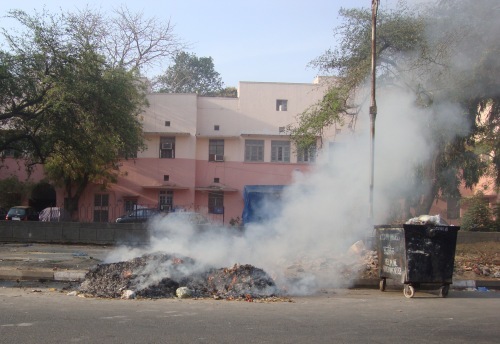 If you spot the burning of leaves in your locality/ college/ work place, please let us know (or send us an image) by writing to blog(at)delhigreens.org or upload them on our facebook.com/delhigreens page.